Suitably Stamped: Coming to you...IN COLOR! It's time for some NEW Stampin' Up! In Colors! possibilities these beautiful new hues give you! Even their names are gorgeous! Don't they take you to some beautiful places in your imagination? 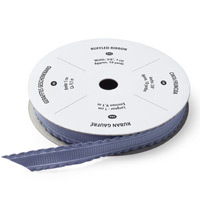 Here's one of my favorites - Wisteria Wonder - in the NEW Ruffled Edge Grosgrain Ribbon. Simply Stunning! So, now that I've got you drooling, want to know some details on my In Color Clubs? Every month for the next 5 months - beginning in September - you will receive the following products in ONE of the 5 new In Colors. AND ONCE during the 5 month club period - each club member will be able to choose an additional $25 in FREE product from any current Stampin' Up! 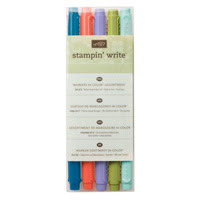 Catalog - including Hostess Stamp Sets! Does this sound like fun to you?!! I'm sure you're wondering just how much it will cost you each month. I mean, that's a LOT of product! Seven different products EACH Month! What if I told you it's just $38.00 each month?! Yes, just $38.00 a month for all the product you see listed, EACH MONTH for 5 months! AND I have a few extras for you as well! Each club member will receive their own copy of the Idea Book and Catalog - a $10 value - absolutely FREE as my gift to you! Each club member will also receive a FREE tutorial each month for two projects using your NEW In Colors! Tutorial will include photos and instructions, just for you! Tutorials will be e-mailed to you in a Word Document so you can save to a file, or print at your leisure! And don't forget - Once during your 5 month club commitment - YOU will receive an additional $25 in FREE Product of YOUR choice from any current SU! catalog! Simply e-mail me at shellsuit@verizon.net and tell me that you want to be IN COLOR! Yes, part of an In Color Club! I'll group you with 4 other people (5 total per club) and randomly assign your color of the month and your $25 FREE Product Month! Each month, you'll forward your payment to me by personal check no later than the 5th of the month. If it's your month for the $25 in FREE products, I will need your selections at the time of payment. You may also add other items to the club order at any time for an additional fee. Once you've been assigned a club group, you'll receive an e-mail confirmation . Each month for 5 months at just $38.00 a month, you receive SEVEN NEW In Color products in a single color. You also receive a full tutorial - FREE - for two fun projects EACH MONTH! AND you receive a copy of the Idea Book and Catalog FREE as my gift to you! Once during the 5 month club commitment, you'll receive an additional $25 in FREE product of your choice! So don't wait, contact me NOW to be IN COLOR!! You're going to love all the NEW In Colors and I can't wait to get them in your hands so you can start creating! Remember, the deadline to join is August 21st!